Sweet and delicious Mandarin Oranges contain large amounts of vitamin C, essential sugars, calcium, potassium, folic acid, vitamin A, and dietary fiber. 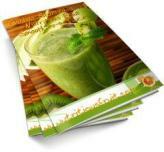 They also help the body retain water and cleanse the body by stimulating detoxification. The vitamins and minerals they contain also treat nervous tension, insomnia, and restlessness. One serving of a mandarin orange can supply one’s day supply of vitamin C but yet only about half of adults consume the recommended levels of vitamin C. Vitamin C is an antioxidant that has many functions such as the promotion of healthy skin and gums (3). It also has the ability to increase iron absorption from non-meat iron sources (iron-rich grains and other plant foods such as whole-grain cereals) when ingested at the same time as the iron (1). Mandarins are a good source of folate which helps build healthy red blood cells, helps produce new cells and enables the body to maintain them (4). Folate has many health benefits including the fact that it may help reduce the risk of neural tube birth defects during pregnancy (2). 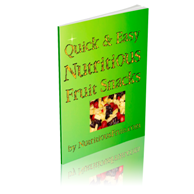 This is especially important during periods of rapid cell division and growth such as infancy and pregnancy. Folate is needed to make DNA and RNA, which are the building blocks of cells (4). 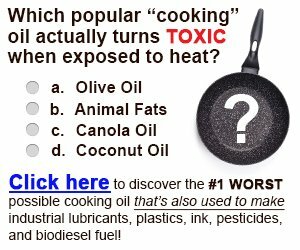 It also helps prevent changes to DNA that may lead to cancer. Both adults and children need folate to make normal red blood cells and prevent anemia. It is also essential for the metabolism of homocysteine and helps maintain normal levels of this amino acid (4). Mandarin oranges contain potassium at levels similar to that of bananas. A diet rich in potassium can help with cardiac health by reducing blood pressure (5). In addition to potassium, mandarins contain low amounts of sodium. A diet that includes high amounts of potassium and low sodium levels may also reduce the risk of high blood pressure as well as the occurrence of stroke. In addition, the peel of dried mandarins is often used in traditional Chinese medicine to treat abdominal distention, to reduce the production of phlegm, and to stimulate digestion (6). The mandarin orange (Citrus reticulata) also known as the mandarin is a small citrus tree that bears fruit which resembles an orange. The fruit is oblate, rather than spherical, and roughly resembles a pumpkin in shape. Mandarin orange cultivars that produce reddish orange fruits are often marketed as tangerines as this name sounds more familiar to consumers. Mandarins marketed as tangerines are usually Dancy, Sunburst, or Murcott (Honey) cultivars. The tree is more tolerant to drought than the fruit. 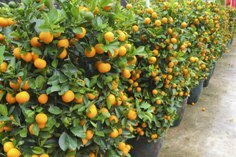 The mandarin is tender and is damaged easily by cold temperatures. It can normally be grown in tropical and subtropical areas. The mandarin has many names, some of which actually refer to crosses between the mandarin and another citrus fruit. Most canned mandarins are of the Satsuma variety which include over 200 cultivars. 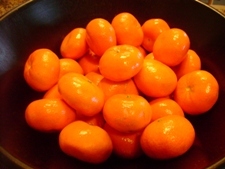 Satsumas are known as mikan in Japan. 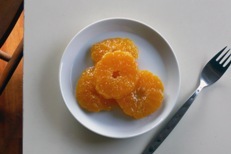 One of the more well-known Satsuma cultivars is the "Owari". This cultivar ripens in the Northern Hemisphere of Japan during the fall. 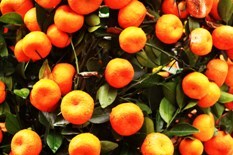 However, in commercial markets today, clementines are becoming more popular than the Satsuma mandarin variety. The tangor, which is also called the temple orange, is a cross between the mandarin and the common orange. Its thin rind is easy to peel and its pale orange pulp is spicy, full-flavored, and tart. 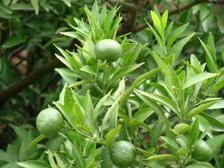 The rangpur is a cross between the mandarin and the lemon. 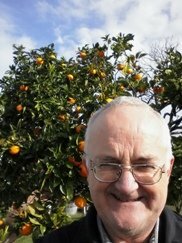 Citrus fruit varieties are usually self-fertilizing (only needing a bee to move pollen within the same flower) or parthenocarpic (seedless varieties that do not needing pollination; e.g. Satsumas). Blossoms from the Dancy cultivar, for example, are an exception. They are not self-fertilizing and therefore must have a pollenizer variety to supply it with pollen as well as a high bee population to produce a good crop. 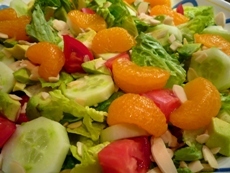 Mandarin oranges can be eaten fresh, used in fruit salads, gelatins, puddings, or on cake. This fruit can also be canned or packaged in plastic containers for commercial sale. The mandarin can be easily peeled with the fingers by starting at the top of the fruit near the depression in the center of the rind. After peeling back the rind at its depression, the mandarin can be split into even segments without losing any of its juice. This makes it convenient to eat, as one doesn't require utensils to peel or cut the fruit. Chiplonkar SA, Tarwadi KV, Kavedia RB, Mengale SS, Paknikar KM, Agte VV. (1999) Fortification of vegetarian diets for increasing bioavailable iron density using green leafy vegetables. Food Research International, 32(3):169-174. Christensen B, Rosenblatt DS. (1995) Effects of folate deficiency on embryonic development. Review Baillieres Clinical Haematology, 8(3):617-37. Whelton P, He J, Cutler J. (1997) Effects of oral potassium on blood pressure: meta- analysis of randomized controlled clinical trials. The Journal of the American Medical Association , 277:1624-1632.